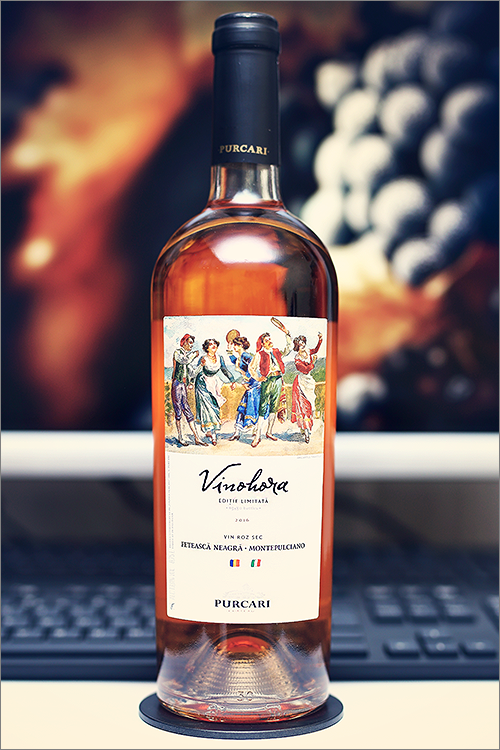 The wine we are going to review today is unique, as it is a rosé wine, made of non-traditional grape varieties: feteasca neagra and montepulciano – Vinohora 2016 from Purcari. The wine is part of the ‘Vinohora’ wine series, that is a set of 3 wines, each with its own personality and character, the philosophy of this series is to marry the indigenous varieties of Moldova with classic international ones. The roles are clearly defined and mutually shared between the two varieties: feteasca neagra forms the body and structure, while montepulciano brings extra flavour and bouquet, that makes this wine stand out from the crowd. That said, let’s find out just how good this wine is. Peach pink color, with orange hues towards the rim of the glass – quite unusual color for a rosé wine. The nose is strong, filled mostly with flavours of sweet berry fruits: sour cherry, raspberry, strawberry, red cherry, sour tomato, red gooseberry, red delicious apple, berberry, wolfberry, red mirabelle, cranberry and some subtle hints of pomegranate. The wine is medium-dry, with moderate alcohol level, high acidity and ripe tannin. This is a slightly fizzy, smooth and velvety rosé wine, with an fruity and elegant profile, as it tastes crisp, slightly tart and lean towards the end. It has a fair overall balance and it feels fresh, complex and rich – a rosé wine that would never disappoint. The wine has a medium-plus finish and a velvety-smooth aftertaste. Conclusion: this is a wine that is just a bit over its prime form – rich, firm and quite expressive, yet lean and slightly opulent, therefore ageing is not an option. We often like to mention that it is always better to drink a wine a year too soon than a day too late, which is valid for this wine as well, therefore drink now and enjoy. In order to enhance it’s palette, we recommend to pair this wine with some strawberry cream shortbread or an oven baked salmon. Saluti!